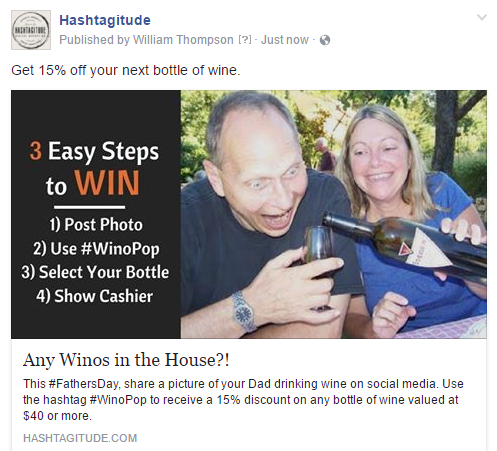 Father’s Day, like most holidays, has awesome potential for social media campaigns: this time of the year is always a fun time to engage with your audience. Holidays provide unique opportunities to create memes, play with puns, get artistic, and share a story. Google Trends is already seeing an uptick in searches for the term “Father’s Day”. Let’s couple that with last year’s estimated $14.3 billion spent on Father’s Day gifts in 2016 alone. It wouldn’t be a bad idea to engage with your readily available audience through Facebook. If you have an analytics tool, use it. If you do not have one, here are some suggestions: Google Trends, Google Adwords, Google Analytics, Google Keyword Planner, Facebook Insight, and Bing Webmaster Tools. Google can’t run a social media platform but it sure as hell can produce data on how users interact with the internet. Use the data to discover what your audience is interested in. For example, Colorado’s most popular gift in 2016 were Oakley’s Sunglasses. Information like that could spearhead many digital marketing campaigns in itself. Build up a keyword list. Create Outbound and Internal Link-Building. Incorporate your email marketing into your plan. Craft your social media to complement your SEO efforts. Holidays are hotbeds full of fun and engaging content waiting to be crafted. Our holiday of focus today is on Father’s Day:all that is left is a bit of elbow grease and creativity. Beer is a staple for Coloradans: over 10% of the country’s breweries are located in Colorado with close to 230 in the state. Why not take advantage of the upcoming holiday and Colorado’s affinity for beer? Make an easy connection for people: dads like beer. The intent for this ad is to increase a mailing list and spread brand awareness. 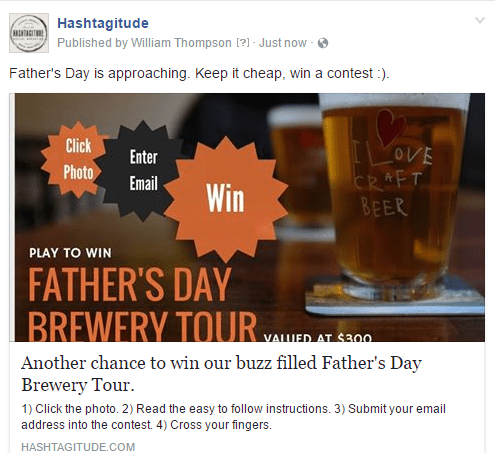 This ad is fun because it incorporates three things very well: beer, Father’s Day, and contest. Our call-to-action expands our audience reach, generates excitement, and creates conversation. Don’t be shy. Use holiday campaigns to bring people to your physical location. Viral marketing is wonderful for achieving this kind of goal. Take advantage of Father’s Day feels by offering your Facebook followers a chance to share those feels. Interactive campaigns do well when the content is emotional, engaging, and shareable. Encourage people to share a hashtag specific to your business or campaign to get a discount or a freebie. Don’t worry, we haven’t forgotten about our eCommerce friends! How can your business use Facebook campaigns to drive people to your website instead of a brick and mortar location? The best way to achieve this is with compelling content. Unfortunately, creating compelling content isn’t spoken into existence. Once you figure out what your objective is, find a way to link it to Father’s Day. The content has to be interesting enough to pique their curiosity to click through (quick note: Please don’t succumb to click-bait). In the example above, the objective is to convince someone to visit “BackyardBBQ.com” to read excerpts from their new cookbook “Backyard BBQ: Little Grillers”. The content is meant to touch an emotional chord with the audience. The ad also provides a call-to-action to visit the website. Sentimental content resonates and produces very clickable content. Once users click through, it’s up to the quality of your landing page to deliver on its promise. Landing pages are too immersive a topic to cover in this post. In short, landing pages should provide the content advertised in the ad. Sites with poor landing pages are usually exited quickly which results in search engines lowering its page-rank. We hope this information and the examples will help you create some engaging Father’s Day content. If any of these ideas prove successful for you, let’s hear about it! 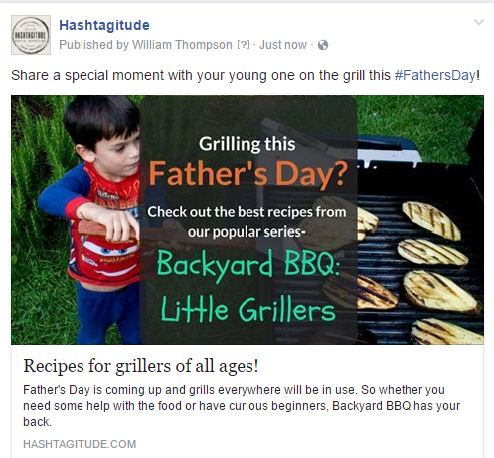 How will you incorporate Facebook into your Father’s Day campaign? Leave us a comment below.